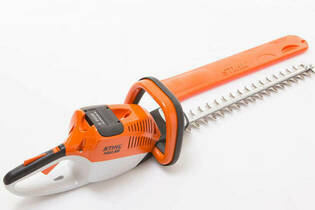 Snapshot: The Stihl HSA 66 is a battery hedge trimmer with a 50cm blade. But is it a cut above the rest? Excellent run time of 90 minutes. We test by cutting horizontally (levelling the top of a hedge) and vertically (trimming the sides of the hedge). Trimming performance scores are based on how quickly and easily the blade cuts through the hedge and the sharpness of the final cut. Penalties apply for jagged edges and when we notice the trimmer struggling with thicker branches. The general comfort and ergonomics of the hedge trimmer, including weight, balance, visibility, and the ease of using the controls.